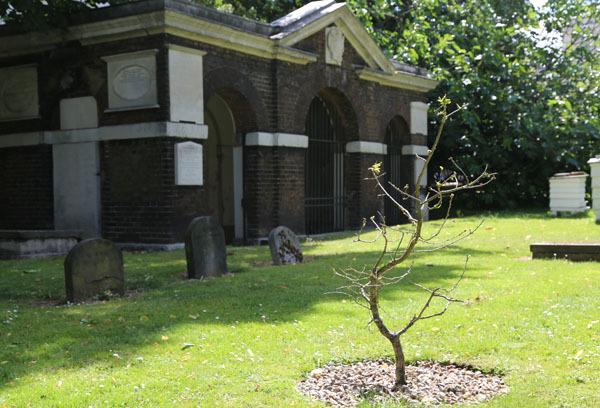 This is the story of how the grave of John Flamsteed - the first scientist appointed as the Royal Astronomer - went unmarked after his death for the best part of two centuries. The name of John Flamsteed is a familiar one around Greenwich. He was the first Astronomer Royal and he himself laid the foundation stone for the new Royal Observatory which was built by Royal Warrant as a base for astronomical studies. Kevin Nolan reports from Portman Road. Colourless and lacklustre, Charlton slipped to routine defeat at the hands of promotion aspirants Ipswich Town in chilly Suffolk yesterday. Hot on the heels of table toppers Bournemouth, Town were hardly hotshots themselves but had more than enough about them to cruise comfortably to victory. The details of Charlton's latest setback, as much as its reality, causes concern about their long term prospects. Tuesday's line-up, with the exception of long-term absentees Stephen Henderson and Rhoys Wiggins, seems just about the strongest available to Bob Peeters. At the halfway point of this grinding, gruelling season, the selection barrel has been scraped. Unless there is unprecedented activity in the January transfer window, what you see is what you get in S.E.7 these days and on an increasingly threadbare squad rests the Addicks' chances of staying in the Championship. No need to panic but relegation is a far more viable prospect than promotion. It must be avoided at all costs. As no doubt it will be. There were sporadic passages of play at compact Portman Road during which Charlton held their own. Some of their football was neat, if toothless. But there was never any valid hope that they would come through against the odds. They have lost the knack of quarrying useful results -admittedly the great majority of them draws- from unpromising circumstances. The rock-like defence which has kept them afloat has shown signs of cracking recently under the strain of protecting no more than the one goal per game regularly provided at the sharp end. Ominously, had the Tractors been a little luckier, this emphatic score line might have been doubled. As early as the 8th minute, notice was served that the visitors were in for a difficult evening. A clumsy foul by Andre Bikey on Daryl Murphy conceded a needless free kick, which David McGoldrick cleverly curled round the wall but, with Neil Etheridge beaten, the ball rebounded harmlessly off the right post. Regular setpieces were a steady source of problems for Charlton and it was from the ninth of ten first half corners that Town eventually broke the deadlock just past the half hour. Paul Anderson's outswinging delivery caused chaos, which centre back Tommy Smith resolved by bashing home his fourth goal of the season from two yards. With their feeble goal-a-game ratio on their minds, the Addicks already were up against it. The livewire hero of Saturday's recovery against Cardiff City, Johann Berg Gudmundsson, again provided faint hope for his laborious side. His slow-motion close range header was cleared off the line before he combined with Chris Solly to fashion a chance which George Tucudean scooped over the bar. Gudmundsson somewhat blotted his copybook on the stroke of half-time with a thoughtless foul on Jay Tabb. Up stepped McGoldrick to bend a carbon-copy free kick past Etheridge but he was even more unfortunate to hit the same post again, with the rebound trickling to safety off the comprehensively beaten keeper. To his credit, Gudmundsson kept trying and his purposeful run stretched Town's rearguard early in the second period but Smith crucially overpowered Tucudean near goal. The Icelandic playmaker then set up Solly to cross accurately and Johnnie Jackson to head narrowly too high. Just as abruptly, the Addicks' hash was settled on the hour. A raking shot from Cole Skuse returned Anderson's partially cleared corner, a deflection flicked up for McGoldrick to head against the bar, leaving prolific scorer Murphy to nod the ricichet neatly into an empty net. The diminutive Tabb was a restless influence and his cute pass was carelessly sidefooted over the bar by McGoldrick. Frankly, the untroubled Tractor Boys could afford his profligacy. Gudmundsson's fierce, angled drive, from Tucudean's adroit lay-off, not only stung Bartosz Bialkowski's hands but represented Charlton's solitary effort on target. It was entirely academic, of course, and really no surprise when McGoldrick finished them off in added time with a well taken third goal. Peeters is experienced enough to know that his side stand at a critical crossroads in yet another problematic campaign. Victory has been tasted on just six occasions, the last of which was the 1-0 triumph at Reading on November 8th. The most recent of four home successes was the 2-1 squeaker over Bolton Wanderers back on a distant October 21st. Charlton have, frankly, forgotten how to win. And they need to quickly remember how it's done before the memory atrophies. Like we said, though, no need to panic yet. Charlton: Etheridge, Gomez, Ben Haim, Bikey, Solly, Gudmundsson, Buyens, Jackson (Bulot 70), Cousins, Tucudean, Vetokele. Not used: Pope, Wilson, Thomas, Fox, Pigott, Ahearne-Grant. Booked: Tucudean. 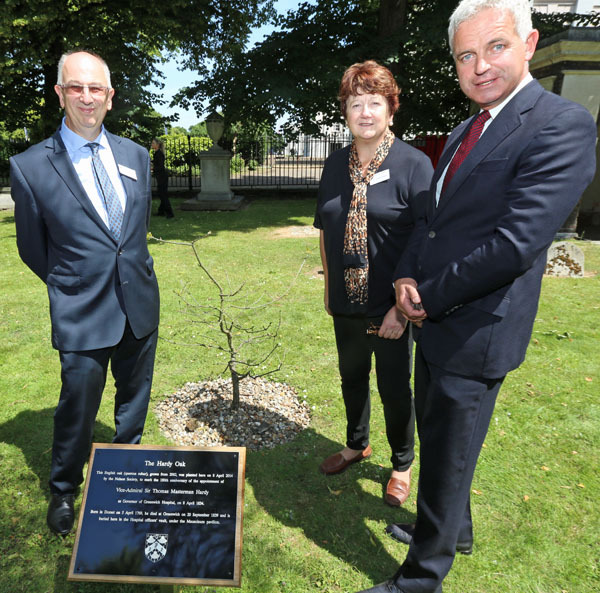 AN OAK tree planted in memory of Vice Admiral Hardy was unveiled in Greenwich yesterday. 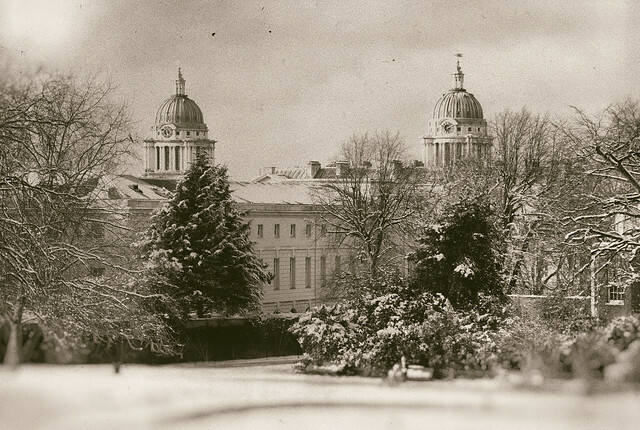 The planting of the English Oak marks the 180th anniversary of the appointment of Sir Thomas Masterman Hardy as the Governor of Greenwich Hospital in 1834. He was the flag captain to Lord Nelson and it was to he that Nelson famously said "kiss me, Hardy" as he lay dying. The tree, planted by the Nelson Society, is close to the old hospital mausoleum in the grounds of Devonport House under which Hardy was buried following his death in 1839. 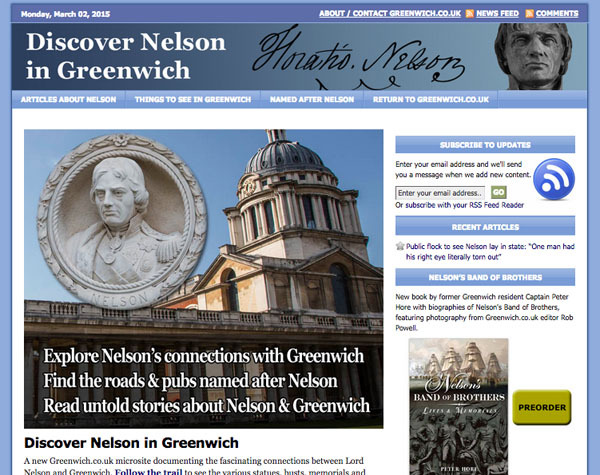 The unveiling was carried out by Paul Ganjou, Chairman of the Nelson Society. The new leader of Greenwich Council, Denise Hyland and deputy mayor of Lewisham, Alan Smith joined Richard Upton, CEO of Cathedral Group - owners of Devonport House - at the event. 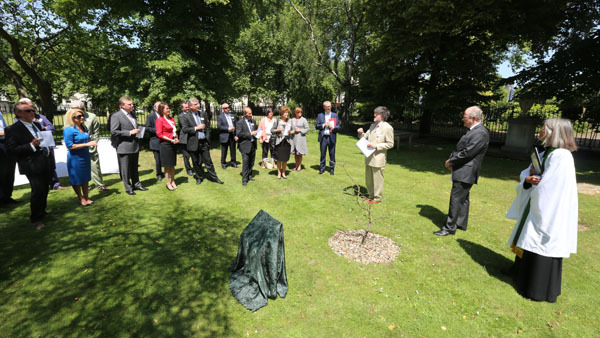 Richard Upton commented: "I am delighted Cathedral Group has been able to plant the Hardy oak tree near to Hardy's burial place. It was a pleasure to welcome the new leader of the Royal Borough of Greenwich and the deputy mayor of Lewisham to Devonport House. 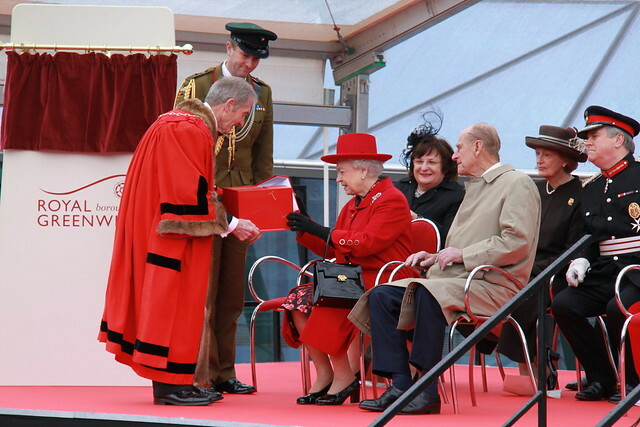 I look forward to there being a closer working relationship between the two neighbouring boroughs." 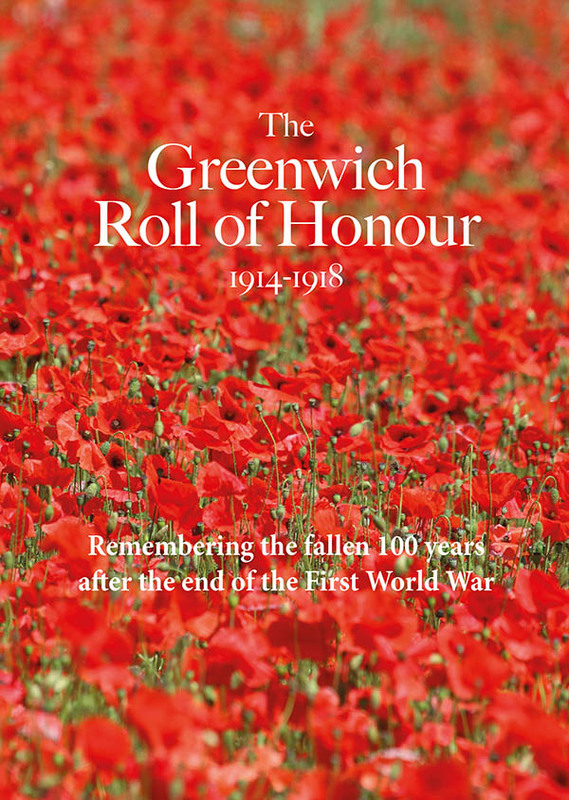 Local MP Nick Raynsford and St Alfege's Chris Moody were also in attendance, along with representatives from the Nelson Society, Devonport House, Greenwich Hospital, the Greenwich Foundation, the Greenwich Society, the 1805 club and local businesses. The blessing of the oak was carried out by Revd Susan Blackall from the Old Royal Naval College chapel. 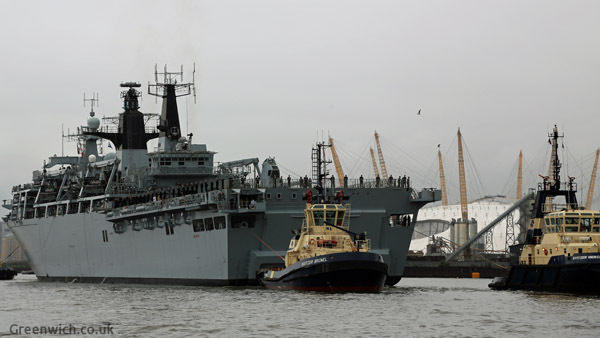 THE FLAGSHIP of the British navy arrived at Greenwich at lunchtime today. 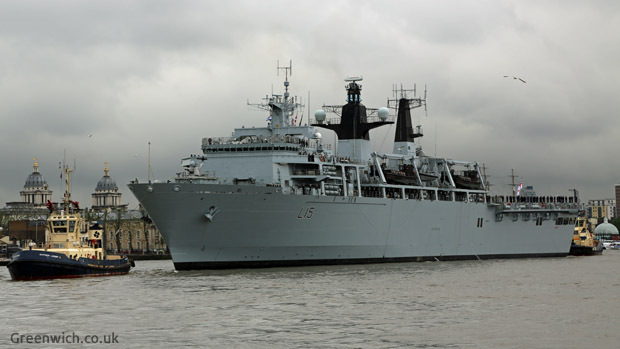 On a grey, wet day, the 176-metre long HMS Bulwark transited through the Thames Barrier, passed the O2 and Old Royal Naval College and then moored at Greenwich Shipping Tier. 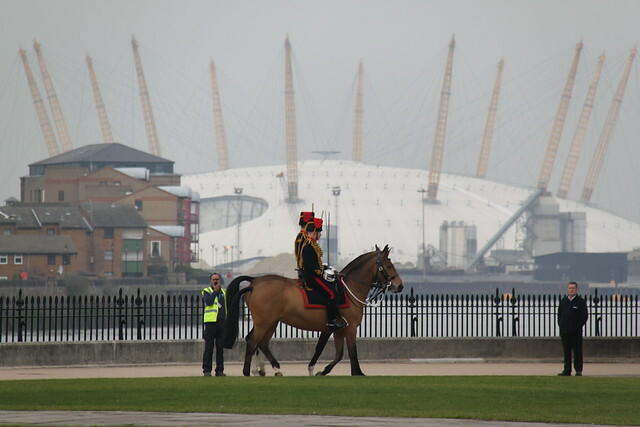 The visit by Bulwark, under the command of Captain Dean Bassett, is one of a number of events this year to mark the 350th anniversary of the Royal Marines. 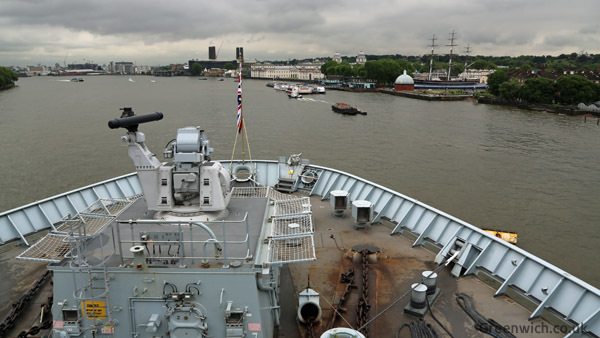 The ship will also receive a visit from the First Sea Lord who is to present the awards for the Royal Navy's prestigious Peregrine Trophy photo competition. 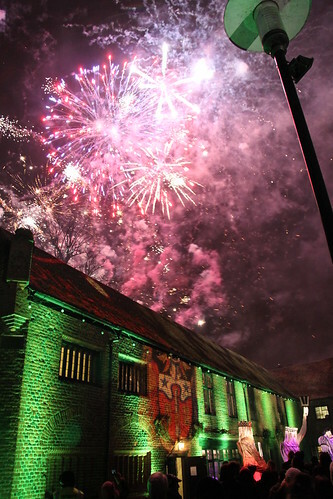 The ship will open its doors to the public on Saturday and Sunday this weekend. Tickets for the chance to explore the Albion-class assault ship were quickly snapped up once available but there will be exhibitions and presentations in the Old Royal Naval College grounds this weekend for landlocked spectators. 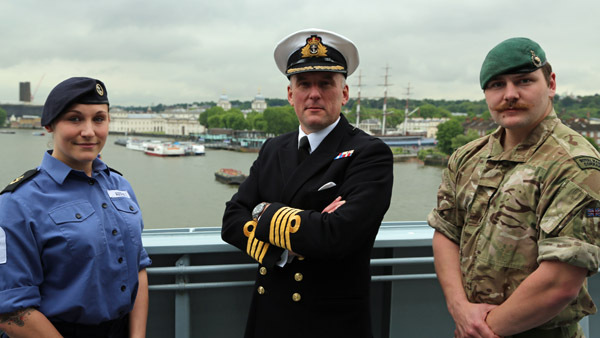 For Greenwich-based Royal Marine Callum Tacey, 22, the visit to London is a proud chance to come home with the ship he works on. "When you get the opportunity to come in to London, it's a good feeling to be at home again, whilst at work too." 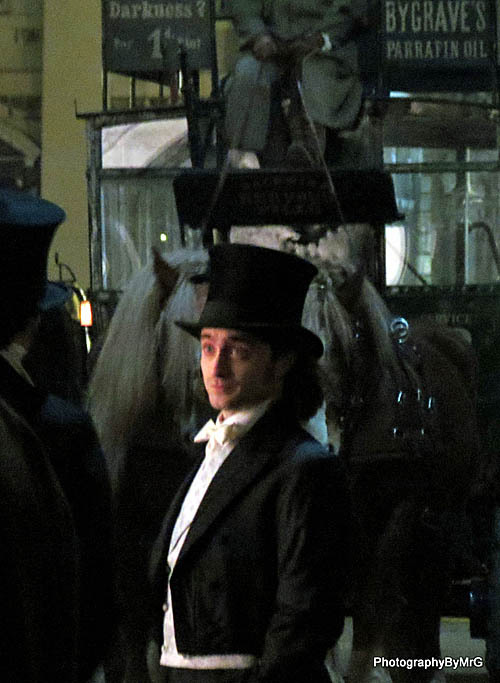 What landmarks did he look out for as the ship came in to London? "The view of Canary Wharf and the Isle of Dogs reminded me of home - it would have been the Cutty Sark but we were facing the other way!" His role on the ship is as a Signaller. "We maintain comms with the boats, make sure the radios work and we pass information on up the chain of command such as contact reports or if there are casualties. That all gets sent up the line through us," he explains. 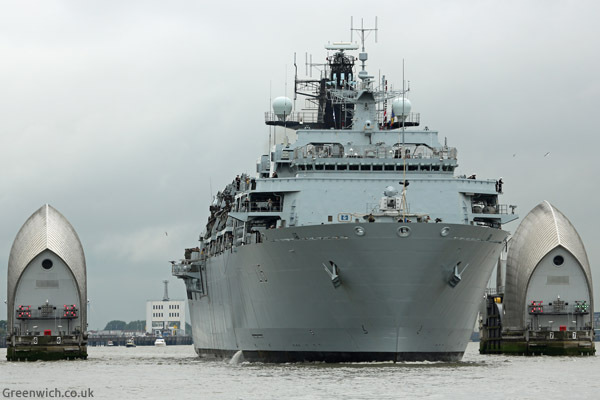 With the First Sea Lord on board, a spectacular air and seaborne capability demonstration will take place on Thursday evening between 8.30pm - 8.45pm. 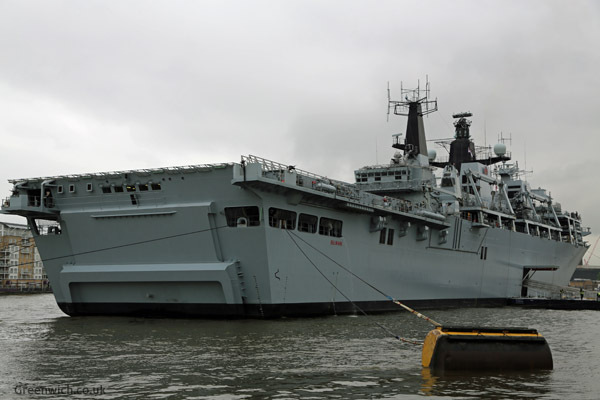 Once she leaves Greenwich early on the morning of June 3rd, Bulwark will head to Portsmouth for a capability demonstration off of Southsea and then sail to Normandy for D-Day commemorations. 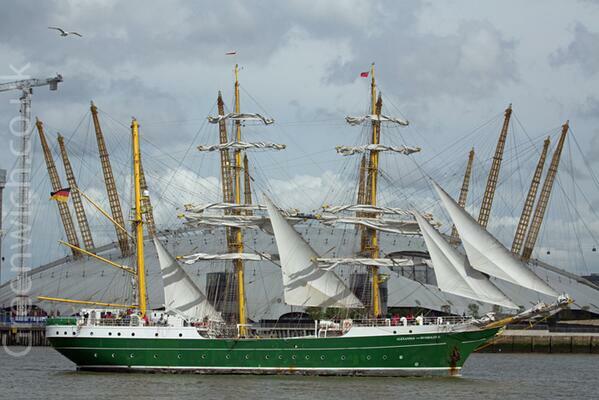 After being turned at Blackwall, the ship was towed past the O2. 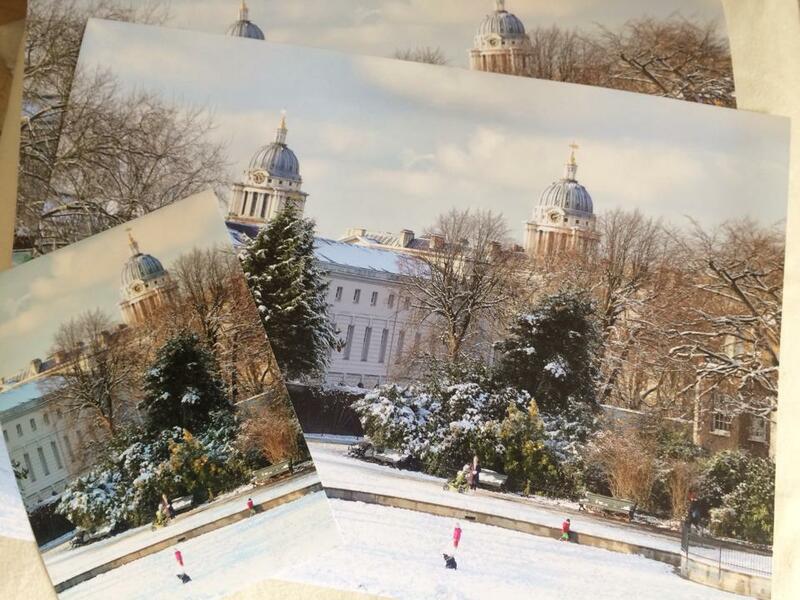 She passed the Old Royal Naval College.